Hello friends! I'm finally back to my regularly scheduled blogging! This week was much more productive than last week, that's for sure! Anyways, it was a pretty relaxing week as I caught up on the blog and did adult-y things like clean my room, go to the bank, etc. I've been taking advantage of this gorgeous fall weather we've been having here in Kansas (bless you Mother Nature) and loving layering up. I did do some fun stuff like go to the movies with my family but that's pretty much the highlight! 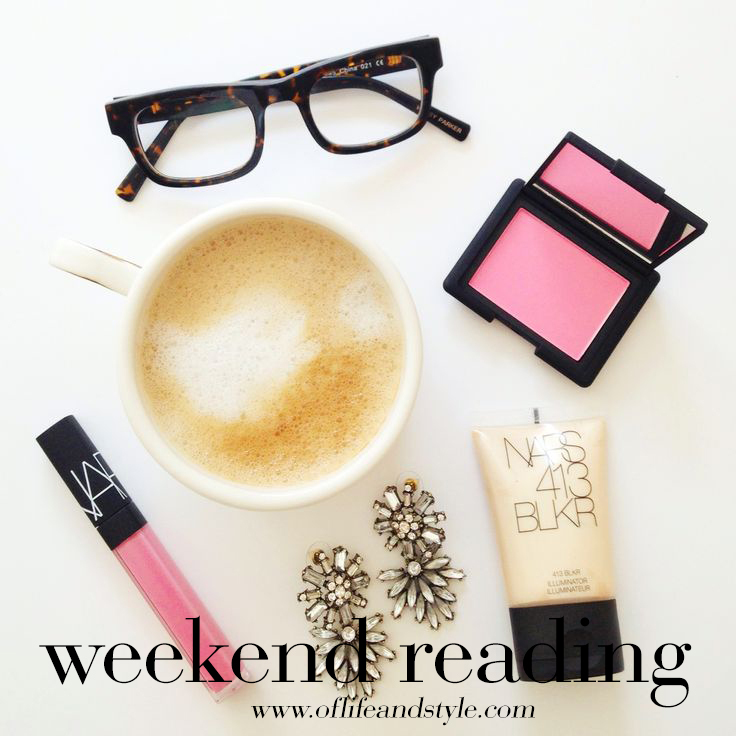 Anyways, this week's Weekend Reading is quite a bit shorter than the previous weeks but has lots of fun links. So let's get to it! This is one of my favorite games Jimmy does! It's so funny! A great article by Carly about staying safe on social media. While the Internet and social media is a great place to connect with people it can also be dangerous. I absolutely love everything about this outfit. From the brooch to the camel colored coat, striped top and pointed toe menswear shoes. Such a fun article to read through! I didn't know some of these celebs had such interesting degrees or went to such famous schools! Netflix released a whole bunch of new movies and TV shows for September. Which are you excited for? I'm dying to travel abroad and Cinque Terre in Italy is one of my top 5! Love this classic, fall/rainy day look by Jean! I also need a pair of red rainboots in my life stat! I'm all about splurging on bags but some of them are ridiculously priced and I for one don't have that kinda money to spend. Here's some great looks for less on favorites like Chanel, Celine and Prada! I NEED to go to Santorini or I might internally combust. What have you been loving on the Internet? Leave me a comment down below!